Alvaro has been a personal trainer at FIT for 10 years. Mr. Maldonado graduated from the National personal training institute and holds a diploma as a personal trainer, Advance personal trainer and a Nutrition Consultant,and Complimenting his experience as a personal trainer. Alvaro is also a producer, teacher, choreographer, and professional performer of ballet and contemporary dance. 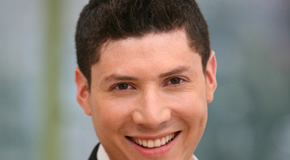 Alvaro’s expertise stems from his years of training in dance, yoga, pilates. Alvaro’s work as a teacher has been featured in dozens of media including, BBC World News, The Washington Blade, The Washington Post, The Washington Express among others. In 2012 Alvaro was awarded “”The Champions of changes” Recognition by “The White House” for his work designing and executing dance and fitness programs for yout at risk in central America and the U.S.
As a dancer, Maldonado began his training at the age of 8 in EI Salvador and honed his skills over the next several years training at the prestigious National School of Ballet, in his native EI Salvador. Alvaro began his professinal international career at the age of 14 for the National Dance Company of EI Salvador and has since performed classical ballet, ballroom, jazz and contemporary dance in over 30 countries. Trained in classical ballet, Modern Dance and jazz he studied at the The washington School of Ballet and the world renowned Alvin Ailey School in New York City where he was granted a full scholarship, as well as dance schools in Barcelona Spain, Mexico, Italy and Argetina.